Mouvement Communiste on the aftermath of the Paris suburban riots of 2005, the reaction of the right and resulting new government policies. Two months after the end of the "riots", one has the impression that nothing occurred in France. 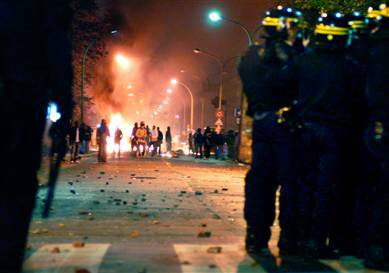 80 percent of French people are convinced that the government has not taken any concrete measures to deal with the problems which caused the riots, and will not do it in the near future. And one can also add that the traditional Left and the radical Left seem to have already forgotten what happened, bemused as they are by 2007 presidential elections. Apart from a petition asking for a general am­nesty and a small weekly meeting in Toulouse and Paris, very little has been done. A demonstration regrouped 200 people in front of a Parisian jail (La Santé) on the 31st December 2005 and that’s about it. Each party of the Left and Far Left is now planning to have its own candidate for the 2007 presidential elections, so probably there will be at least 5 candidates for the Left1 and inside the SP a violent battle is raging between the numerous male candidates (nicknamed the "elephants" of the Party) and a Blairite woman leader. One group of the Far Left (the Trotskyist LCR, Revolutionary Communist League) campaigned in some suburbs with the help of actors, stand-up comedians and rap musicians to convince young people to vote for next elections. Even if the first and only meeting they organised in Clichy-sous-Bois2 was not welcome by the local youth who criticized this initiative, it was relatively "successful" because 500 new electors got enlisted in a town of 15,000 inhabitants. But it’s difficult to imagine how social problems, which have not been dealt with for 30 years, will be magically solved after the next elections. If the Left and Far Left were and are still passive as regards the working class youth, the Right has taken a whole series of initiatives, either symbolic measures (like the creation of a commemoration day for the abolition of slavery, or the suppression of one article of a law praising the "positive role of French presence" in its former colonies), or very concrete measures (against unemployment benefits and for a new two-year labour contract) which will influence and affect both French and foreign young workers. The Right wing has also adopted an agressive and dynamic attitude towards the question of national unity, in the "Gaullist" tradition, hailing France’s capacity to offer an attractive national model, able to reunite the descendents of the French slaveholders and settlers, the descendents of the Revolutionary republicans led by the Enlightenment philosophers, and the descendents of the former colonized people. Cocorico! Just after the riots, a new federation was created: the CRAN (Representative Council of the Black Associations). Imitating the CRIF (Representative council of the Jewish institutions) and the CFCM (French Council of the Muslim Cult), 60 small associations decided to introduce the "Black question" into the French political debate. They were pushed to adopt this attitude by the success of a law recognizing slavery as a crime against humanity adopted in 2001 and also by deeper changes in both African and French West Indian "communities".3 But the "Black" social scientists and intellectuals of the CRAN were also pushed ahead apparently by the participation of a significant number of French West Indian, French-African or African young people to the riots (at least, that was the analysis of the Renseignements généraux – the political police – and some right wing politicians and sociologists). The CRAN is a re-groupment of intellectuals, academics, journalists, etc., who are trying to get a piece of cake from the Neo-Gaullist State. And just two months after the creation of the CRAN, President Chirac gave them some crumbs to play with: he created a foundation about the history of slavery, which will be presided by a former West Indian independentist, and he accepted to commemorate the abolition of slavery on the 10th of May. These symbolic gestures were accompanied by a small (and also largely symbolic) battle, much debated in all the medias, about the article 4 of a law defending colonialism and pressing teachers to teach its virtues at school. If this law had not provoked any significant reaction in Parliament, and only minority protests among historians and Leftwing people, when it was adopted in February 2005, it provoked several protests and demonstrations in the French West Indies in December 2005, obliging the French Robocop (Sarkozy, minister of Interior) to cancel his visit to Martinique and the Right-wing pro-colonialist lobbies to swallow their article 4. Chirac obliged the most reactionary MPs of his party (the UMP) to suppress one article of a law already voted several months ago!4 The President and his Prime minister claimed that France had to recognize the "dark sides" of its colonial past in order to recreate a new national unity. So strangely enough, the November-December riots pushed the Right to make three symbolic gestures towards the French-West Indians or French-Africans who feel discriminated because of the colour of their skin. It also helped the Right to adopt an officially anti-racist and even slightly anti-colonialist attitude (as regards the past, not the present course of French imperialism obviously). These measures did not cost anything to the State, but they were an answer to all the "rioters" who had shown their French ID to French and foreign TV cameras and explained that this document did not protect them against racist discrimination in France. And these measures were also directed towards those who will vote in 2007, specifically the West Indians who have an important role in electoral politics both in Metropolitan France and in the French West Indies. The Right did not only adopt these symbolic measures, it also decided to launch all its forces in an offensive against unemployed, foreign illegals and young wage-earners. Unemployment is a permanent structural feature of French economy and one of the factors which can explain the November-December riots. Youth unemployment is quite high (23 percent is the most quoted statistics, as opposed to 11 percent for all age categories), specially for unqualified workers, and among them for French-Africans or French-North Africans (see below the annex about immigration in France). So the government made a lot of noise about its "new social measures in favour of the unemployed" while in 2005, 200,000 people have been deprived of their unemployment benefits. And in 2006, thanks to its new decisions, 100,000 people will loose 11 months of unemployment benefits and 50,000 will loose 6 months of their unemployment benefits. So the perspectives for unemployed in general are grim: 90 percent of them get less than the minimum wage (1,357 euros per month before taxes). And the bluff of the right-wing is easily revealed by the fact that the number of people getting the RMI5 has climbed up 7 percent last year. This CPE (First Hiring Contract)6 is a new breach in the Labour Code which will enable a boss to pay no social charges to the State for 3 years. If last year the government favored small businesses (under 20 employees) with a contract called CNE (New Hiring Contract)7, this year it targets all companies over 20 employees and gives them the possibility of renewing this new contract several times. The advantage of the CPE is that the employee can be fired without any reason and at any time. As regards temporary training periods inside enterprises, which are so vital for young people who are leaving high school or university because they have no job experience, the government has made a lot of noise about "the most social and protective measures" ever taken, because it decided to oblige the bosses to pay these training periods after 3 months… But it knows very well that they usually last much less! And to top it all, the government has authorized young people who are 15 years old to work on night shifts. 1 One Communist Party, one Socialist Party, one Green and two Trotskyist candidates. 2 The suburb where the 2 young guys were electrocuted on the 27th October, the event which started the riots. 3 Since the 1970s, the attitude of both Africans and French West Indians living in Metropolitan France has radically changed. Their associations have progressively modified their politics, specially the West Indians who don’t fight anymore against West Indian immigration into Metropolitan France but try to better their situation here, and act as a pressure group both on local West Indian and on French politics. The same is true also for some African or North African "communities": for example, the Malian associations decided to influence the transformation of Malian society from abroad through all sorts of projects linked to NGOs, and not to limit their activities to the hope of returning "home" one day. 4 This law basically served the practical interests of the former French settlers and their Algerian collaborators - "harkis" - during the Algerian war: they are particularly numerous in the South of France, and thus important electorally. 5 Minimum Insertion Revenue, 433 euros per month for a single person, attributed to the 1,4 million of people who are not "allowed" to receive unemployment benefits. Unemployment is a permanent structural feature of the French economy and one of the factors which can explain the November-December riots. Youth unemployment is quite high, especially for unqualified workers, and among them for French-Africans or French-North Africans.